Looking for a New Chevrolet Equinox in your area? 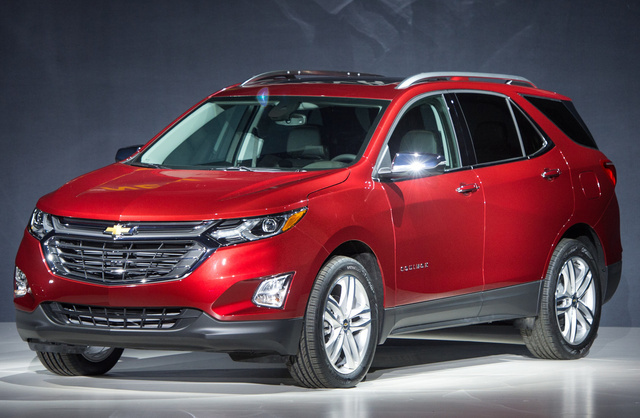 CarGurus has 3,145 nationwide Chevrolet Equinox dealers with 268,356 new car listings. Chevrolet sanitizes the 2018 Equinox for your protection, but in the process erases what personality it may have exhibited otherwise. 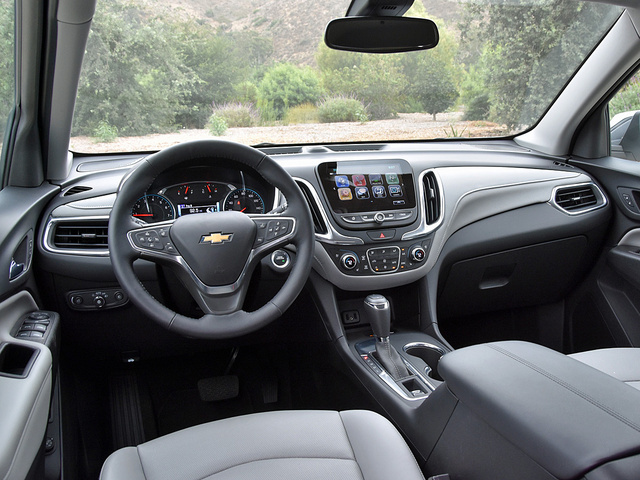 For more than a decade, Chevy has positioned the Equinox in the space between compact and midsize crossovers, mixing generous seating room for people with somewhat restricted space for cargo. Marking a shift in strategy, the redesigned 2018 Equinox is actually smaller in almost every way, putting it squarely into competition with other compact SUVs. 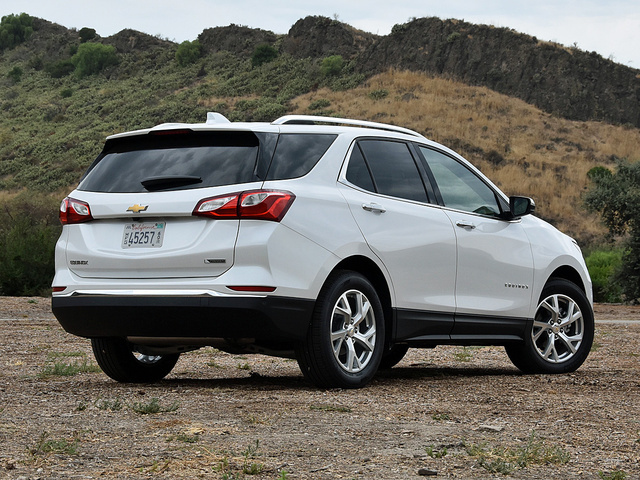 Does the new Chevy Equinox have the talent and skill set to take on the best vehicles in the segment? In the holiday classic “A Charlie Brown Christmas,” the bald and buffoonish protagonist is sent out to find a fabulous tree for stage-play decoration. Penned in the early 1960s, when artificial aluminum “trees” were evidently popular in American households, the television cartoon depicts Charlie empathically drawn to a feeble but real pine tree. He selects it, brings it to the festivities, and is immediately labeled a “blockhead” for doing so. For years, I’ve felt about the Chevrolet Equinox what Charlie Brown felt for that little tree. Last redesigned for the 2010 model year, the Equinox wasn’t such a bad little SUV. It was overweight. It was underpowered. It had a small cargo area. And many of its interior materials were shoddy at best. But, the Equinox was attractively styled, affordably priced, and quite roomy compared to the typical compact crossover SUV. Plus, you could get an optional V6 engine, one that made over 300 horsepower and instantly resolved its lethargic character. There was real value in the previous-generation Equinox and unique attributes that lent it genuine character. A couple of years ago, Chevy spit-shined the Equinox, but the result wasn’t as successful as when Charlie Brown’s crappy so-called friends reassigned Snoopy’s doghouse decorations to the little pine tree. Nothing short of a complete redesign could possibly eliminate the Equinox’s gray hairs and deep wrinkles. Now, for 2018, the Equinox finally gets the complete redesign it has needed in order to remain competitive. Chevrolet offers the new 2018 Equinox in four trim levels, with a choice of three engines, and with two different transmissions powering the front or all four wheels. Prices range from a low of $24,525 for the base model without any options to nearly $40,000 with every option. And that’s before factoring in the cost of either of the Equinox’s optional engines. My test vehicle had top-level Premier trim, the standard 1.5-liter 4-cylinder engine, and front-wheel drive (FWD). The only options included the Confidence and Convenience 2 Package, which installs a long list of comfort and safety features, and a pricey Iridescent Pearl paint job that added $995 to the window sticker. At $34,625, my test vehicle was priced right in the same neighborhood as the median average selling price of a new vehicle in America. What’s important to remember, though, is that my test vehicle didn’t have several appealing options, such as all-wheel drive (AWD), a navigation system, a premium sound system, a panoramic sunroof, or a 19-inch wheel upgrade. Those extras would inflate the price to $39,695. Yikes. Like everything about the new Equinox, except for its price tag, the styling is inoffensive. 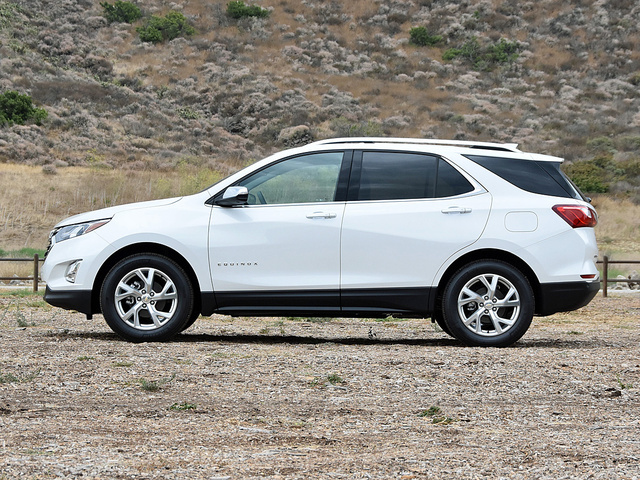 There are hints of Malibu, hints of Cruze, hints of the old Equinox, and hints of the new redesigned Traverse. The result, to my critical eye, is balanced but bland. I don’t think the paint is worth the cost. In fact, I thought this SUV was Summit White until I noticed the upcharge on the window sticker and then went outside to see if it sparkled. Also, while the Premier’s standard 18-inch aluminum wheels are attractive, they’re not quite large enough to completely alleviate the Equinox’s “overfed” appearance. Unfortunately, the only way to upgrade to the 19-inch wheels is to add more than $5,200 in options to the Premier trim level. Moving to the interior, my test vehicle’s Medium Ash Gray leather was layered over a Jet Black base and accented with polished metallic surfaces, creating a high-contrast environment for a more upscale look and feel. Although some details lack the elegance of a truly premium vehicle, the overall effect successfully elevates the SUV’s cabin. 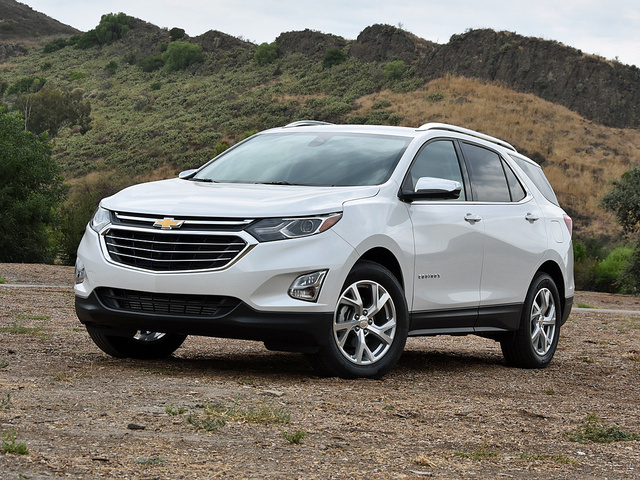 At some point during the 2018 model year, Chevy will offer Equinox buyers a choice between two turbocharged gasoline 4-cylinder engines and a turbocharged diesel engine. 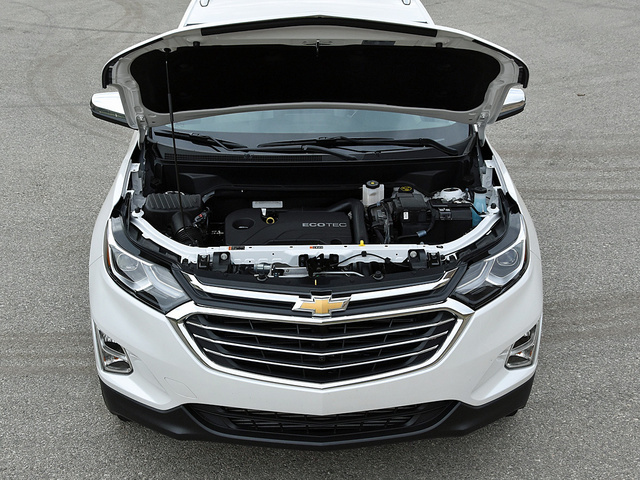 As of the middle of the summer of 2017, when testing for this review was completed, the only engine available in the Equinox is the standard 1.5-liter turbo four. Making 170 horsepower at 5,600 rpm and 203 pound-feet of torque between 2,500 and 4,500 rpm, the engine works hard, and it’s a good thing the Equinox dropped a reported 400 pounds with this redesign. A 6-speed automatic powers the front wheels, and AWD is available for an extra $1,750. My test vehicle did not have AWD. What it did have was a bit of turbo lag and a hint of torque steer. Power is adequate. The Equinox gets up to freeway speeds and powers up mountain grades with minimal effort, but I lacked confidence in its passing capabilities. At low speeds, the Equinox is generally quiet, the engine’s grumbling barely evident. Accelerate hard, and the 1.5-liter groans more than it revs. At higher speeds, road and wind noise drown out engine racket. Fuel economy is a major disappointment. The EPA says a FWD Equinox with this engine should get 28 mpg in combined driving. I got 23.3 mpg on my test loop. That represents a significant shortfall. Driving dynamics are fine. Nothing about the steering, the brakes, or the suspension is worth remarking upon, which is almost certainly by design. The Equinox goes where it is steered, stops quickly and smoothly, and provides a good ride combined with decent handling. Notably, this was the first Chevy I’ve driven in quite a while that did not scrape its front air dam on the shallowest of dips and driveway aprons. On the grooved pavement of the 101 South freeway in Southern California’s Ventura County, it did tramline in an irritating fashion, likely due to the 18-inch P225/60 Michelin Premier LTX tire selection. Also, on a warm testing day, the brakes did fade a bit after repeated use while driving out of the Santa Monica Mountains to the coast, but they still performed a relatively effective panic stop while hot. If I had to describe my feelings about driving the Equinox in one hyphenated word, that word would be non-plussed. I don’t dislike it. But I don’t like it. It isn’t fun to drive, but neither is it a chore. Basically, what Chevy has done here is to sand down every potential rough edge and to tie up every possible loose end, which is great. 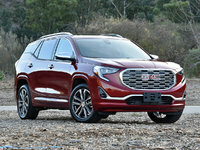 GMC has done the exact same thing with the latest version of the Acadia. The problem is that in the process, whatever character and personality the new Equinox might have exhibited has also disappeared. Rumor has it that Chevrolet shrunk the 2018 Equinox to clear space in its SUV lineup for the return of the Blazer. Should that plan come to pass, the Blazer would be a Chevified version of GMC’s Acadia, slotting between the Equinox and the redesigned 2018 Traverse. Given America’s insatiable appetite for SUVs and nostalgia, this seems like a can’t-miss plan. 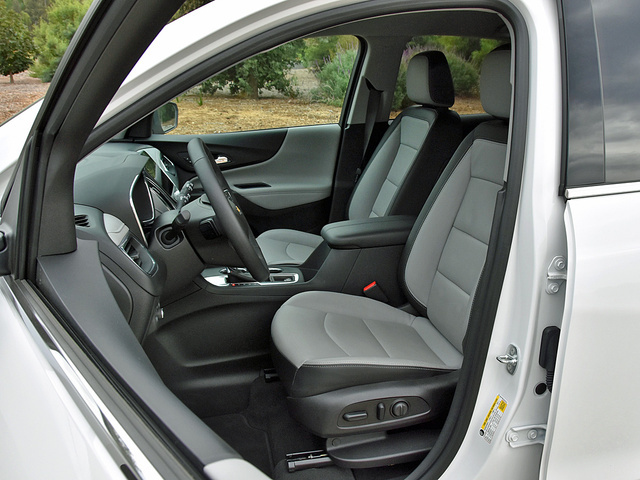 But, as a result, the new Equinox is dimensionally smaller inside, nevertheless remaining comfortable for four adults. Five people can squeeze aboard when necessary. Comfort impresses, thanks to a supportive 8-way power driver’s seat, a steering-wheel rim shaped for a reasonably comfortable grip, and a densely padded center console. More padding is needed for the door-panel armrests and the upper door-panel trim. As part of the test vehicle’s Confidence and Convenience option package, the front passenger’s seat offers 8-way power adjustment, and the heated front seats gain a ventilation system for hot summer days. The package also includes heated outboard rear seats. 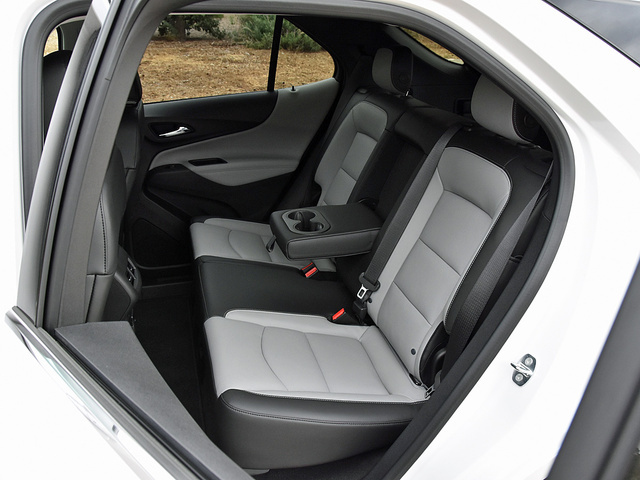 Backseat occupants enjoy robust thigh support and plenty of legroom, and the seatbacks recline for napping. Unfortunately, the Equinox loses its sliding rear seat in favor of “kneeling” bottom seat cushions that collapse to ensure a flat-folding seatback. By waving a foot under the rear bumper, you can open the available hands-free power tailgate to reveal cargo space measuring 29.9 cubic feet. A handy covered storage area is beneath the load floor, and Chevy provides release handles inside the cargo area that fold the rear seatbacks down in order to create 63.5 cubic feet of space. Those, by the way, are not terribly impressive numbers. What is impressive is the Equinox’s control layout and infotainment system. Everything is located where you expect to find it and works the way you expect it to work. Furthermore, material quality is decent, build quality is good, and Chevrolet provides plenty of storage space within the Equinox’s cabin. I’m a big fan of Chevrolet’s MyLink technology for its simple layout and graphically pleasing interface. Highlights include a volume knob flanked by tuning buttons, Apple CarPlay and Android Auto smartphone projection technology, and OnStar subscription services with a 4G LTE Wi-Fi connection. The Equinox’s cabin is littered with USB ports. The tray forward of the shifter has them, the center-console storage bin has them, and rear-seat occupants have them, along with a 120-volt electrical outlet. Chevrolet also offers tablet computer holders as an accessory, clipping them to the front seat head-restraint posts so that passengers can stream entertainment via the Wi-Fi hotspot. An embedded navigation system and a Bose premium audio system are options for the Equinox, but they were absent from my test vehicle. 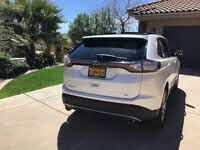 My Equinox did have a 360-degree surround-view camera system, though, which made parking easier. When it comes to safety, with the new 2018 Equinox, Chevy takes aim at parents of younger and older children alike. A Rear Seat Reminder system is standard equipment, designed to remind parents that they may have accidentally forgotten about a certain someone in the back seat, whether that’s a child or a pet. Teen Driver technology is also standard, enabling parents of teen drivers to program specific vehicle attributes in order to encourage safer driving practices, to keep a remote eye on the vehicle’s whereabouts via a smartphone app, and even download a driving report card after the SUV returns home to see how fast your kid went and how many times the driver-assistance systems needed to intervene. Additionally, OnStar’s Guidance Plan subscription package includes automatic collision notification, crisis assist, and emergency services, among other features that help to justify its monthly or annual fee. Chevy’s roster of driver-assistance and collision-avoidance systems is largely limited to the LT and Premier trim levels, and with the Safety Alert Seat you can trade audible warnings for tactile vibrations felt through the driver’s seat. Unfortunately, no matter how much money you have to spend, you cannot get adaptive cruise control or a full-speed-range automatic emergency braking system for the new Equinox. Also, as this review is published, crash-test ratings are unavailable for this SUV. Here’s the bottom line on the new Equinox. Aside from its artificially inflated price tag and observed fuel-economy result, there isn’t much to complain about here. But at the same time, aside from its comfortable seating, infotainment system, and child-related safety features, there isn’t much to rave about, either. As it has done with all its recent redesigns, General Motors has refined the Equinox to the point that it is inoffensive, innocuous, and invisible, seemingly built for people who don’t really care about what they’re driving as long as what they’re driving is “American.” And since the Equinox is assembled in Canada, with 40 percent of its parts coming from Mexico, I’m not even sure it qualifies as that. Personally, I’m not a fan of this “sanitized for your protection” approach to product development. Chevy knows how to build vehicles that spark emotion and inspire passion, and that is just as important in something like the Equinox as it is in a Camaro or a Corvette. Otherwise, what you end up with is something as forgettable as this competent but not compelling SUV. 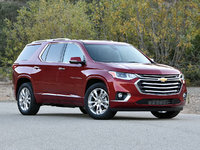 And that’s probably why Chevy has left itself plenty of room in the pricing to offer big, fat, juicy rebates on this SUV. Without them, the Equinox doesn’t strike me as a particularly cost-effective compact crossover SUV. What's your take on the 2018 Chevrolet Equinox? Jetstar_28 It will not compete well with the midsize crossovers. GM is out of phase with the current position of folks wanting ride with wider wheel track. The Cadillac XT 5, Ford Edge, Lincoln MKX, have significantly better dimensions, width, wheel track and ride than this vehicle will. People will not like the longevity of a turbocharged nor the performance of a turbo lagging 4 banger. If the fuel economy requirements are eased, folks will still want to enjoy the longevity and performance of a V6 engine option vs. the risk of a catastrophic engine failure around 100,000 miles that will mean a severe depreciation of the vehicle and increased true cost of ownership through the life of the vehicle. john22580 The transmission in my Equinox failed at 57,000 miles. $3700! I feel ripped off. Don't exceed mileage warranty or get badly burned. newcar1111 Why wasn't the transmission repair covered under the 100,000 mile warranty. It is part of the drive train. Imma His transmission was covered under warranty. What he wanted to say, I think, was to warn others about keeping abreast of the warranty miles as the transmission should not have gone out so soon. I had to rush to trade in my 2012 Nox as then they were having serious engine problems. Chev. Lengthened 2010 and 2011 warranties but not 2012 as they said the 2012 didn't have the engine problems. I have written proof that they knew about the 2012 models.! Users ranked 2018 Chevrolet Equinox against other cars which they drove/owned. Each ranking was based on 9 categories. Here is the summary of top rankings. Have you driven a 2018 Chevrolet Equinox? Enter your zip to see incentives for a new Equinox in your area. 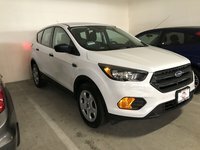 Do you lease SUV’S new/ pre-owned and if so how much per month and down payment or no down payment? Which is best. Drivers don’t do a lot of traveling.